For a gift that keeps on giving, the gift of thrills, the gift of relaxation and above all - memories - a Virgin Experience Days gift card is your ticket to treat someone in a truly unique way. What exactly is a Virgin Experience day? It’s your chance to surprise someone and gift them a chance to do something they’ve only ever dreamt of. Simply browse the different gifting options on offer and take your pick from the array of categories that includes Flying, Food & Drink, Short Breaks, Theatre and much more. Treat yourself or another with a Virgin Experience Days gift voucher and choose from a classic Hot Air Balloon ride, a pamper day for two, car racing, paintballing and more. With experiences fit for every taste and every occasion too - for birthdays, an anniversary or even just because - there will always be an experience to delight with Virgin. eGifts will be active 24-36 hours after you receive them so please do not attempt to redeem immediately. 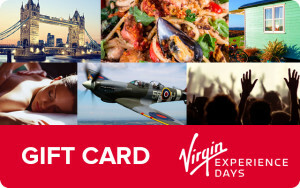 Visit virginexperiencedays.co.uk/giftcard to choose from a huge range of exciting experience days and short breaks. Enter your voucher details at the checkout.